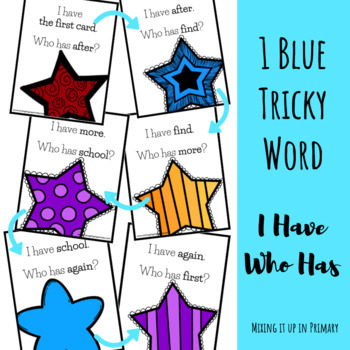 Use this activity as a way for students to practice reading tricky words. Make learning fun by teaching students how to play I Have Who Has. Play this game as a whole group, small group or individually. This product comes in color and black and white. Click here to view more American Reading Company Resources. Visit www.mixingitupinprimary.com for more lesson ideas and resources! If you plan to share this product with other teachers in your school, please add the number of additional users' licenses that you need to purchase at a discounted price. Earn TPT Credits by leaving feedback on the products you have downloaded! Click on TPT Credit Balance under your account to learn more!